Let down of a week...but what a great blog post. I went to the court house to testify against the criminal mastermind that stole my bike and caused my unspeakable mental unrest! I was really looking forward to getting into the courtroom and forcing some tears. At the very least I was hoping to get a portrait drawn by the court room sketch artist. 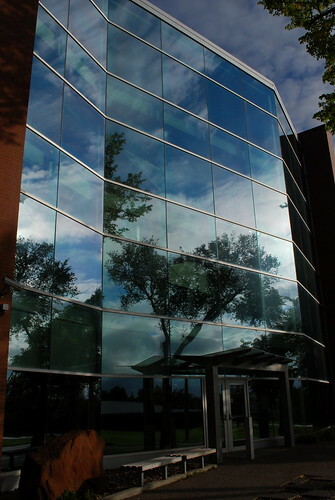 My hopes were pushed to even greater heights when the prosecution attorney (a UWO grad!) mentioned witness pay! Not only was I gonna get to sit in a witness box (a personal dream of mine) but I was gonna get paid for it. This was truly going to be a day for the ages. Blog fodder for weeks to come! Before I got my shot they had to do some sentencing in another trial so I waited in the crown's witness waiting room with the guy who bought my bike off the defendant. We got to talk about how our lives had been forever changed by this act of larceny (I'm not sure if the Island has a victim's support group, but i guess this would have to do.) After the escorting the defendant from the previous trial out of the courtroom in leg shackles I was sure that my case would be up next. I started my witness preparations. Tissues, Check. Clear voice, check. Getting the waterworks ready (mentally replaying that scene from Rudy where Rudy's father comes into the Notre Dame Stadium for the first time and declares that it is the greatest sight his eyes have ever seen), Check. Prepareing to answer the question "Do you see the man who stole your bike anywhere in this courtroom? Could you point him out? ", Check. (Note: I never saw the guy so i would have answered no but i think the perjury charge would have been worth it). Ready to defend myself when the high priced defense attorney cross-examines me and goes after my credibility, Check. I was ready to go when in walks the officer in charge of the case and he tells us to go home. The jerk struck a last minute plea. And I was unceremoniously stripped of my right to testify! I wasted the majority of my morning. I got dressed up for this! I wore a belt for this! I even showered for this! Let me testify! The worst part of it all...I wasn't a witness thus no witness pay! I've said it before and I'll say it again: The System Doesn't Work! In Algae News, not much to report. Last Friday I started 1000L of algae. It was a real rush job. some grew some did not. My expectations were low so it turned out to be par for the course. I'm growing more this week and can't wait for this whole episode to come to an end. 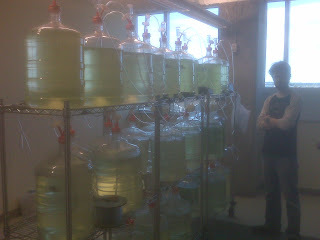 Here is a picture with some bubbling vats of potential algae. Note that I was not expecting the picture so that is not a pose. But I did demand that they take the picture with the Elizabeth Taylor soft filter on it. 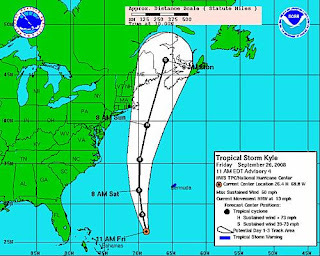 So what is next for me and this tiny island community...Tropical Storm Kyle! According to the weather network it is headed right for the Maritimes and should be dropping rain on us by Sunday night. They also said that we can expect power outages because all the tress have their leaves still and a few will probably get knocked over taking some power lines with it. Why do we put all our power lines directly below trees? We are really asking for a power outage! I am only kinda worried about this because I live in downtown Charlottetown. The priority will be to get that power back up as soon as possible because if the tourist can't get into the Anne of Green Gables Store on Monday the economy will come to a complete halt. Also I'm sure I'll survive with out electricity. As long as I have my internet, computer, TV and PS2 I'll be fine. I try not to use my lights very much anyway and no alarm clock would be a blessing in disguise! 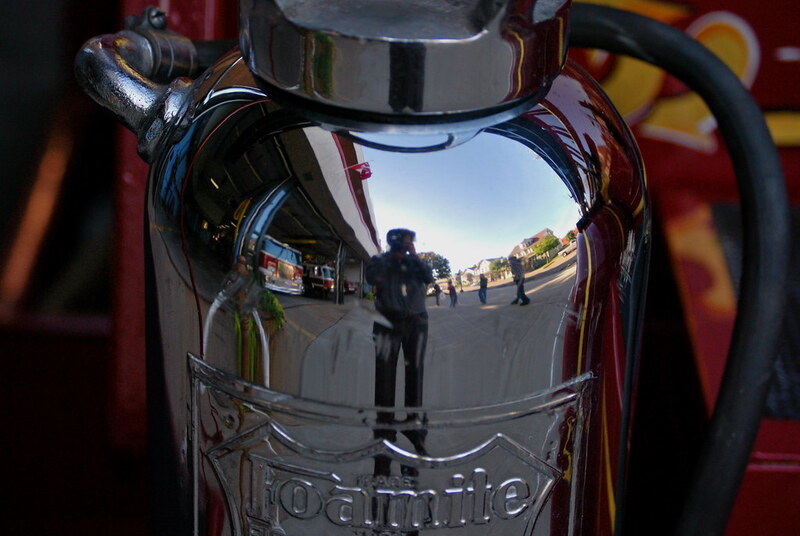 Reflecting on my work, originally uploaded by mmilway. Blogging os not for everyone. I don't know how these people continually post something new every day or so. I just don't have that much going on. This past week has been hellish and next week might be at least a little comedic. Last week my bosses asked me if I could grow 1000L of algae by the end of September. I was silly and said that I could. Last Friday I had 20L of algae growing and by monday i was up to 100L. It took me all week but i scaled it up to just under 1000L by yesterday. I got to see the sun rise twice and made a trip to the emergency room! (I cut my finger on a glass pipette like a newb) No stitches necessary but now I know where the hospital is. Thats right. there was no need to modify the word hospital with silly words like nearest, best, fastest etc. its the only one. I have been carrying my camera around with me where ever i go so i should be updating my pictures on flickr/facebook/picasa sometime soon. Hopefully my next post will come sooner rather than later.